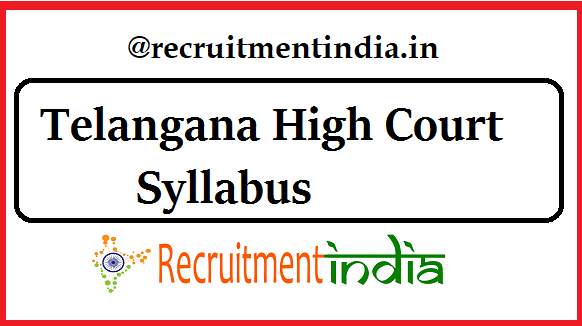 Telangana High Court Syllabus 2019 Free Download link can be found here. By clicking that link applicants can download the TS HC Civil Judge Syllabus that too official one. Exclusive Telangana High Court Civil Judge Exam Pattern of screening test and mains exam has bee posted here to give a clear understanding of both exams paper scheme. TS HC recruitment section strictly follows the rule of the merit. So those who wrote the exams they will be selected. From today onwards start the reading of TS HC Civil Judge Syllabus 2019 as you have no long period of time for the exam. Telangana High Court Civil Judge Syllabus 2019 is urgently required by the participants of TS High Court Civil Judge selection process. LLB qualification having candidates in Telangana, do you find that Telangana High Court initiated the recruitment of 67 Civil Judge Vacancy for the first time after the formation of Telangana state. Now the job location of the appointed candidates is only within the state of Telangana only. For this opportunity plenty of the applicants are eagerly waiting, so don’t hesitate if you are eligible then submit your application form, immediately start the preparation of Telangana High Court Syllabus 2019. The notification released board also thinks about the requirement of the candidates so it has given the Telangana High Court Syllabus 2019 Civil Judge. The selection process is a three-stage selection process. One is the screening test, written exam(mains exam) and viva voce test. They have included the Telangana High Court Civil Judge Syllabus of two written exams along with the recruitment details. So while checking the notification only contenders can find the TS HC Civil Judge Syllabus. Actually, the screening test is mainly conducting to filter out the maximum number of applicants. The marks in the screening test are not helpful for the contenders for the selection, it is only for the qualifying nature. Candidates at the time of studying the Telangana High Court CJ Syllabus 2019 should have known that for the mains written exam the TS HC will shortlist the candidates in the ration 1:10. In the screening test round, the only the maximum number of contenders will be eliminated hence applicants are a focus on scoring the higher marks in the exam. Although the marks in the screening test are not considered for the final merit list to shortlist for the mains written exam securing more marks in the exam is important. If possible for you prepare the TS HC CJ Main Exam Syllabus along with screening test preparation, so that you can manage to read the entire Telangana High Court Syllabus 2019 portion in time. Compulsory follow the reference of Telangana High Court Exam Pattern to ease your preparation. Schematic view of how to start the syllabus has to be planned by the contenders according to the exam pattern. TS HC CJ Screening Test Pattern is of a single paper with a total of 100 questions for 100 marks. Time duration is 2 hours. After qualifying in the screening test, candidates will get the eligibility to write the main examination which is tougher. Telangana High Court Civil Judge Exam Pattern of mains exam is completely differenced from the screening exam. In the mains there is a total of three papers, each paper is for 100 marks. Scores of the contenders in the mains written exam will determine the applicant’s appointment as Civil Judge.